I love your lady head planter - what a fun purchase...and your table looks beautiful! Oh Kitty, what a lovely Irish table scape with so many yummy looking things. 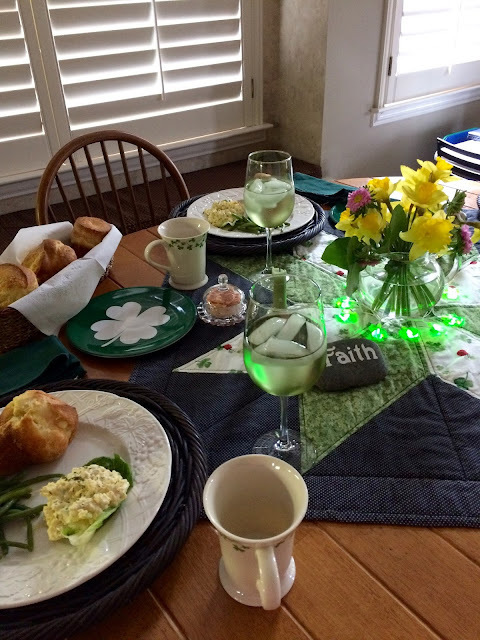 I love all of the wonderful shamrock décor and that beautiful teacup! What a wonderful hostess you are and I'm sure you and your Molly made lovely memories together. Sweet hugs to you this Monday morning! St. Patrick would approve of your Irish-themed tea setting, Kitty! I especially like the neat lady planter head which reminds me of your other pretty lady vase. Your Irish lunch with your daughter looks very tasty. 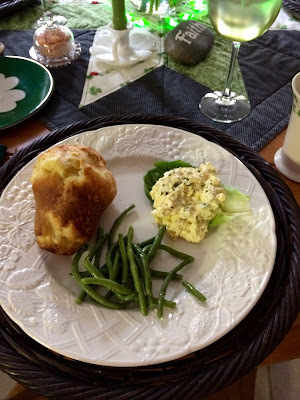 I don't think I've ever had popovers or Irish soda bread muffins? If I won a gift card to a store with a restaurant, I would have spent it on the delicious foods too! What a fun planter, Kitty! I love shamrock plants and I must see if I can find one here. Your soda muffins sound wonderful and would be lovely with a cuppa tea. How lovely to have lunch with your Molly. Your table is delightful. Happy St. Patrick's Day, my friend! Hugs to you. Hi Kitty, oh you decorated the table so pretty! It sounds like you had a fun time when your daughter came over for lunch and the food sounded so good. Thanks for sharing the recipe for the muffins at our C&C with J&J. What a great idea for the Irish soda bread. I will have to make this recipe! Have a great week and a Happy St. Patrick's Day. 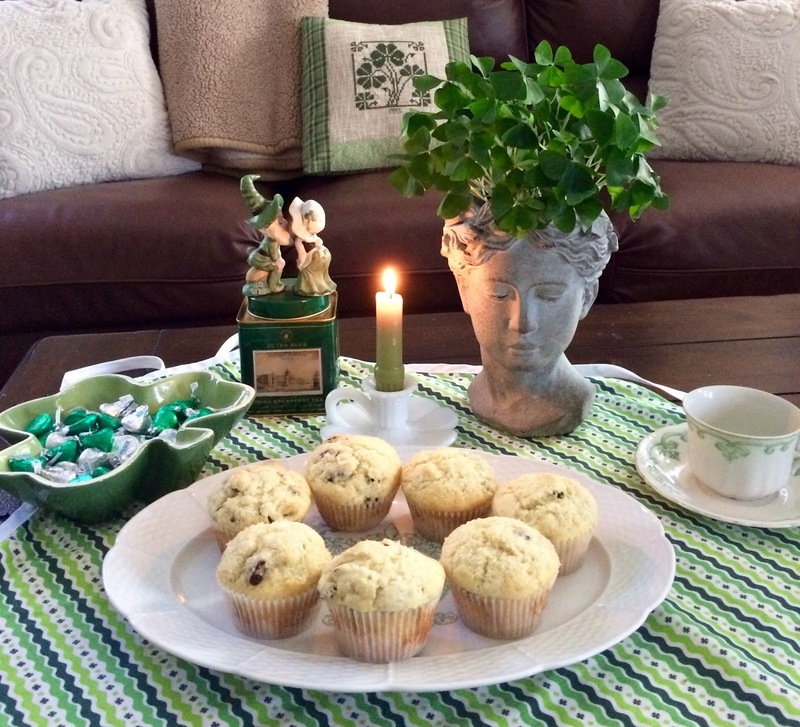 What a charming tablescape!The lady head planter with shamrocks is unique!Beautiful teacup and cute Leprechaun couple,so darling!I also love the cheerful tablecloth and your floral bouquet.Your muffins look yummy...Everything is perfect to celebrate St Patrick's Day!Hugs! Everything looks so wonderful, Kitty. You are all set for the 17th. Your lunch menu sounds so delicious. Your leprechaun couple are the sweetest things. You have a daughter named Molly....how delightfully Irish.=) Your table looks positively delightful. Love that shamrock plate and I must say your lady planter is fabulous! Oh sweet friend! Everything looks so festive and pretty! Your posts always lift my spirits. Praying for you! Hi Kitty, What a wonderful tea for St.Patrick's Day. I love your beautiful planter of the shamrock plant. Such a beautiful teacup and I love that celtic design. Thank you for sharing the soda bread muffin recipe. 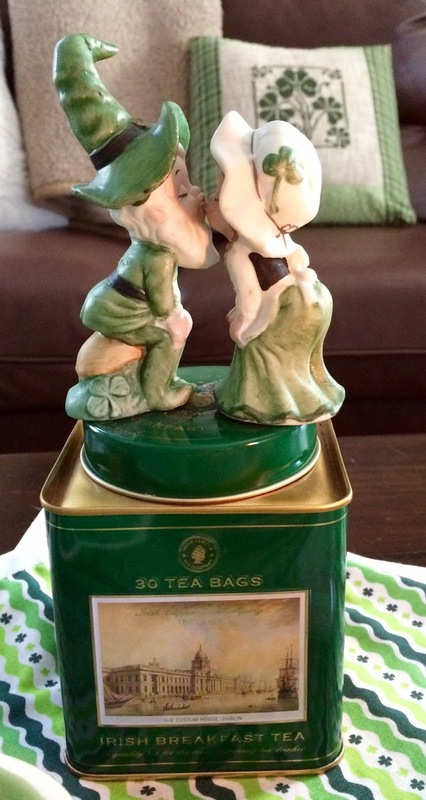 The sweet couple figurine from your mother, topping the beautiful keepsake tin, is adorable. How nice Molly Colleen was there for lunch!! You have set the perfect table to celebrate one of my favorite times of the year. Being half Irish I just love this. Wishing you a Happy St. Patrick's Day sweet friend. Love all your photos, Kitty. Your muffins would be a nice start to the day with a cup of tea. Pined!! This is such a neat idea!! I had not thought of muffin size. Great idea. Love that tea cup. Your Irish vignette is so adorable, and full of so many memories and special treasures! The muffins sound delightful, but I know the best part was fixing the luncheon for your daughter. How much fun she used her NM $ to take you to lunch! 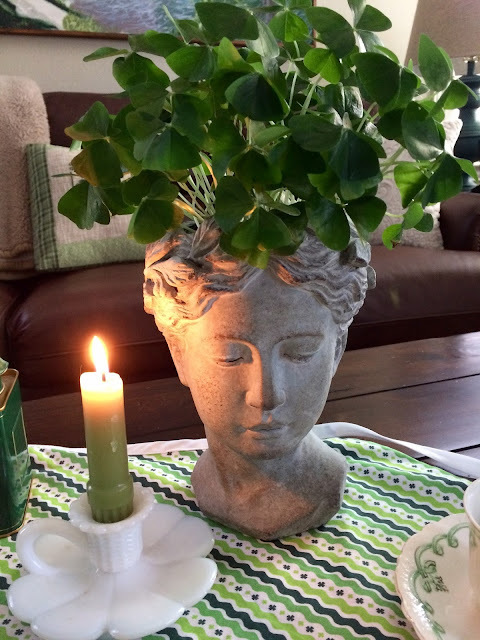 I love your table with the sweet head vase and Shamrock plant! The muffins sound yummy. I love Irish soda bread, so I want to try them. I love your cups, I love your plates, I loved that you used an apron is a table covering, and I love, love, LOVE that lady head vase with the shamrocks. I am crazy about lady head vases, but I haven’t seen one quite like that before. It looks perfect on your table. Also, I am going to try your Irish soda bread muffins. You mentioned omitting the caraway seeds, I always do that too, and I use anise seed in place of them. I know it’s not traditional, but I like it so much better. Kitty, what a delightful post! And I know I'll enjoy those not-too-sweet muffins with a nice cup of Irish breakfast tea. How fun and it all looks delicious. Thanks for linking to Keep In Touch. Kitty, what a darling vignette. Love the ladies' head with shamrocks, what a great find. The dishes are so pretty. You have some wonderful collections. What perfect little irish soda bread muffins. I am off to check out the popovers. Thanks for the well wishes. Sciatic nerve pain is no picnic. What a sweet luncheon with your daughter. I am in awe of your lady vase and her green Shamrock hair. I planted mine in the yard last year but doubt they survived the winter - that's yet to be determined. Your Irish Soda Muffins look very lovely! Thank you for sharing Kitty! Love your Soda Bread Muffins Kitty, they look delicious! Have a great first week of spring and thanks so much for sharing your awesome post with FULL PLATE THURSDAY! I am a bit late to your "party" but glad I made it. I have missed reading your posts as I have been away from blogging for awhile and from reading blog posts. But I am back. I must try the Irish Soda bread. Thanks for the recipe. I so enjoy seeing your different table settings each week. I've got to get another shamrock plant for our house. I kept a shamrock plant in our home(s) for about ten years, but I have a hard time getting them to grown well here. Yours is so pretty! 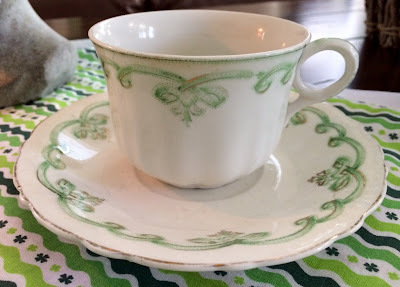 I love, love that teacup and saucer; the center design reminds me of the clodagh symbol. 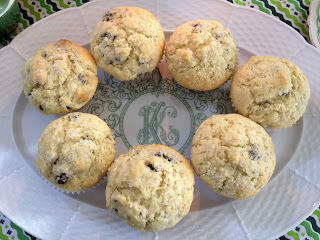 I have already pinned this recipe for Irish soda bread muffins; they look delish. :D Thank you for sharing! Yours and Molly's lunch looks so tasty, Kitty; mother and daughter lunches are the best.